Did anyone got a message from browser saying that the download page has been reported as a malicious site? Did you even take a look at the previous posts? Rebell explained why this is happening. Last edited by Vulcanus on Wed Apr 13, 2016 4:00 pm, edited 1 time in total. Does it crash at some particular point or just randomly? How long does it take to crash? Minutes? Hours? What are you doing at the point of crash? Where is your character? it crash when You push the button to start TibiaAuto after nick choose. I have done several tests, and crashed when autolooter now makes its function, but in loot autoattack works well, but the loot custom does not work, lootea all the items. After you click "Ok.", don't open Tibia back. Thanks. Could you try to reword? Or make a screenshot? I don't exactly understand what do you mean. I think he is using both Auto Looter and Cavebot at the same time. From what I understood, the looter from Auto Lotter is the one that crashes. Guys, you have to keep in mind that if you are using the Cavebot module you CANNOT use the Auto Looter module as well. Strange behaviors will happen since both modules will try to open the corpses and loot them. Auto Looter is supposed to be just for when you are MANUALLY hunting and don't want to loot the corpses yourself. 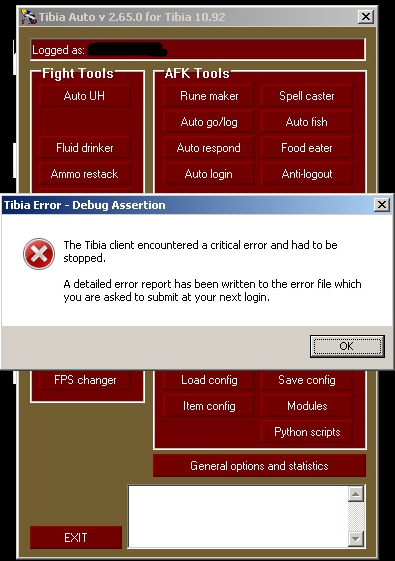 SO I am running TA and TIBIA as ADMIN, and it all crashes when i choose my charater or load some script. Never had those problems before. Last edited by damboszek on Wed Apr 13, 2016 5:34 pm, edited 1 time in total.